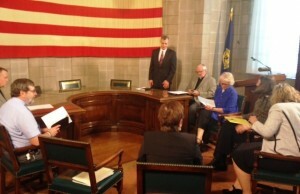 On Tuesday, March 31, eight OTOC leaders met with Nebraska Governor Pete Ricketts to discuss issues of concern to OTOC. These leaders articulated why OTOC is concerned about several issues including, Medicaid Redesign (LB 472), Driver’s License’s for DACA qualified immigrant youth (LB 623) and efforts to improve behavioral health, prison reform and address climate change in Nebraska. Rev. Marshall Johnson framed the meeting by acknowledging that Governor Ricketts opposes two pieces of legislation that OTOC supports (Medicaid Redesign & Driver’s Licenses) but that there are other issues where OTOC would like to work with the Governor and help his new staff learn about community needs including behavioral health, increasing funding for Federally Qualified Health Clinics and climate change.Read More . . .